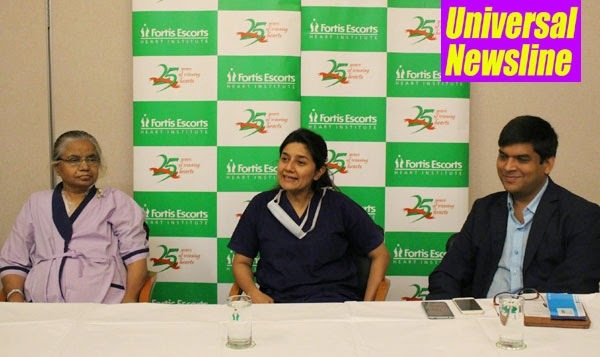 New Delhi, April 15th, 2015:, Fortis Escorts Heart Institute, pioneer and Centre of Excellence in Cardiac Care for over 25 years, conducted an unusual heart surgery by installing the pacemaker in the lower abdominal cavity of a 68 year old woman who is also a second time cancer survivor. This is one of the few such cases reported in India. The surgical team of doctors was headed by Dr. Aparna Jaswal, Senior Consultant in the Department of Cardiac Pacing and Electrophysiology. The patient, Naseema Begum, came to the doctors at FEHI two years ago, when she had her first pacemaker implanted in the right heart cavity while she was suffering from cancer of the left breast. Subsequently, the cancer spread to the right breast and caused infection which trickled to the pacemaker installed in her right heart cavity. With a history of double mastectomy, doctors were presented with a unique challenge as there was no area in the chest or upper abdomen where the device could be re-implanted. Dr. Aparna Jaswal and her team performed the surgery of implanting the second pacemaker through a different route as opposed to the conventional one. The new pacemaker was given an unusual location through the leg vein in the lower abdomen, also referred to as the retro peritoneal way. A pacemaker is a small device that is placed in the chest or upper abdomen to help control abnormal slow heart rhythms or arrhythmia. During an arrhythmia, the heart may not be able to pump enough blood to the body. This can cause symptoms such as fatigue (tiredness), shortness of breath, or fainting. Severe arrhythmias can damage the body's vital organs and may even cause loss of consciousness or death. The pacemaker uses electrical pulses to prompt the heart to beat at a normal rate. In addition, the pulse generator attached to the pacemaker contains a small computer processor that can be programmed to set the rate of the pacemaker, the pattern of pacing, the energy output, and various other parameters. The pulse generator for most modern permanent pacemakers weighs one to two ounces. According to available data, approximately 20000 patients in India which has a population of over 120 million receive ICD implants every year. Medical tourism also constitutes for 7000 – 8000 pacemaker implants every year. Fortis Escorts Heart Institute (FEHI), Delhi, a pioneer and centre of excellence in cardiac care, is celebrating 25 years of path-breaking work and service to the numerous heart patients, who have benefitted from treatment, at this outstanding facility. Armed with clinical expertise and cutting-edge medical technology, the hospital has set enviable benchmarks in Cardiac Bypass Surgery, Minimally Invasive Surgery, Interventional Cardiology, Non-invasive Cardiology, Pediatric Cardiology and Pediatric Cardiac Surgery. Till date, FEHI has successfully completed over 1,72,000 Coronary Angiographies, over 90,000 Cardiac Surgeries and almost 52,000 Coronary Angioplasties, in addition to several life-saving procedures. The hospital also performed India’s first Trans Catheter Aortic Valve Implantation (TAVI) and Bioresorable Vascular Scaffold (BVS); Asia Pacific’s first Directional Atherectomy, Angioscopy, Drug Eluting Stenting, etc. Over the years, FEHI has cloned a Heart Care Network of 19 hospitals and Heart Command Centers in India and abroad. It has also launched the revolutionary e-ICU program, enabling remote and timely access to critical care. Fortis Escorts Heart Institute has won numerous awards and accolades, the most recent among them being the ‘Best Cardiology Hospital’ at the ICICI Lombard & CNBC TV18 India Healthcare Awards for 2012, 2013 and the No 1. Ranking in the Private Cardiac category Hospital by The Week Nielson Best Hospitals Survey, 2014.